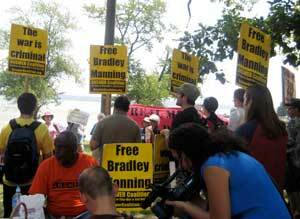 Supporters of Private Bradley Manning had a rally and march on Aug. 8 at Quantico Marine Base in Virginia. Manning, who was arrested and charged with releasing a graphic videotape showing killing of civilians and journalists in Iraq, is in prison at Quantico Marine Base. The demonstration was called by numerous organizations, including the ANSWER Coalition, Code Pink, Courage to Resist, March Forward!, IVAW-DC, Veterans for Peace, and others. The demonstration received widespread media attention, including CNN and other television networks. Today's New York Times has a prominent front page story about Manning that continues on page 3, where two photos of the demonstration are prominently featured. Speakers included Andrew Castro, ANSWER Coalition; Medea Benjamin, Code Pink; Jeff Patterson, Courage to Resist; Iraq war veteran Josh Stieber; Rev. Lennox Yearwood Jr., President of the Hip Hop Caucus; Ellen Barfield and Mike Marceau, Veterans for Peace; Phyllis Bennis; former CIA intelligence officer Ray McGovern and others. “We stand here today in defense of all those who dare to tell or reveal the truth about a criminal war. During the Vietnam War, the government wanted to send Daniel Ellsberg to jail for releasing the Pentagon Papers, which proved that the government had lied to the people about the war. But the American people realized that Ellsberg was right and the war was wrong, and the protests against the war intensified. 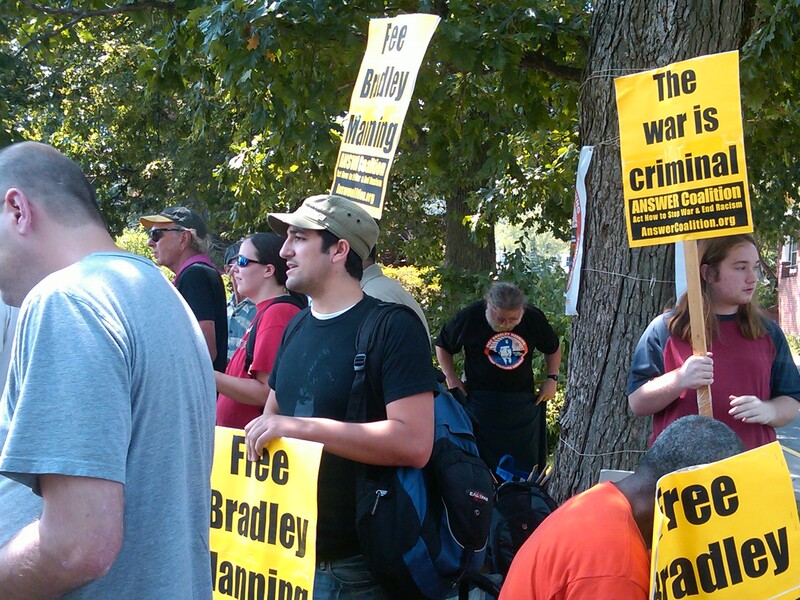 As the rally closed, the crowed marched down Potomac Avenue in the heart of Quantico Marine Base, chanting "Free Bradley Manning!" News reports suggest that Bradley Manning may be charged with the release of the 75,000 documents that WikiLeaks posted on its website recently. Those documents paint a grim picture of the repeated killing of Afghan civilians in a deteriorating military occupation by U.S. and other foreign forces. We want to thank those of you who have continually supported the work of the anti-war movement through your generous donations. If you haven't made a donation, please do so now. We can't do it without everyone's help. If you have donated but can donate again, please make another urgently needed contribution.